India and its dreams can be fulfilled only by strengthening university research. This is where we need grand reforms. Why I chose to lecture on this topic? Exactly a year ago, on September 14, 2015, one of the grandest scientific instruments ever built, LIGO, whose team I am a part of, detected a signal that came from collision of black holes some 150 crore years ago. It took us about six months to be sure that this signal was exactly a phenomenon Albert Einstein had predicted 100 years – gravitational waves or in more trippy words, ‘ripples in the four dimensional spacetime fabric’ on which resides stars, galaxies and everything we call “our universe”. This is hailed as the discovery of the century, and a new chapter has since opened in mankind’s quest to understand the universe and its origins. When we announced this discovery in February 2016, the first world leader to congratulate us was our Honorable Prime Minister, Shri Narendra Modi. In a series of tweets, he also announced what scientists in my field were eagerly waiting for – the LIGO-India project. A 16 sq. km. gravitational wave detector, and only third such in the world, this project was stuck in bureaucracy for years, and within days after Prime Minister’s tweets, the project got Union Cabinet approval. In what can be regarded by future historians as the largest science outreach by any government since moon-landing, the Prime Minister in his Mann Ki Baat discussed at length about the discovery of gravitational waves and India’s plans to invest in this new scientific field. For a young scientist, this was a fairy tale moment! One of the most abstract scientific theories – Einstein’s General Theory of Relativity, one of the most complicated instrument on earth – LIGO, and this was capturing interest of the top office of my country! When Prime Minister visited Washington DC in March 2016, India and the United States signed an MoU, and the LIGO-India project is now ranked as the highest S&T priority between the two nations. During the signing of MoU, the Prime Minister interacted with four of us LIGO scientist who were part of this discovery, and it was his suggestion that young scientists like us should visit more often the universities in India and inspire students to be part of such mega-science investment of our country. 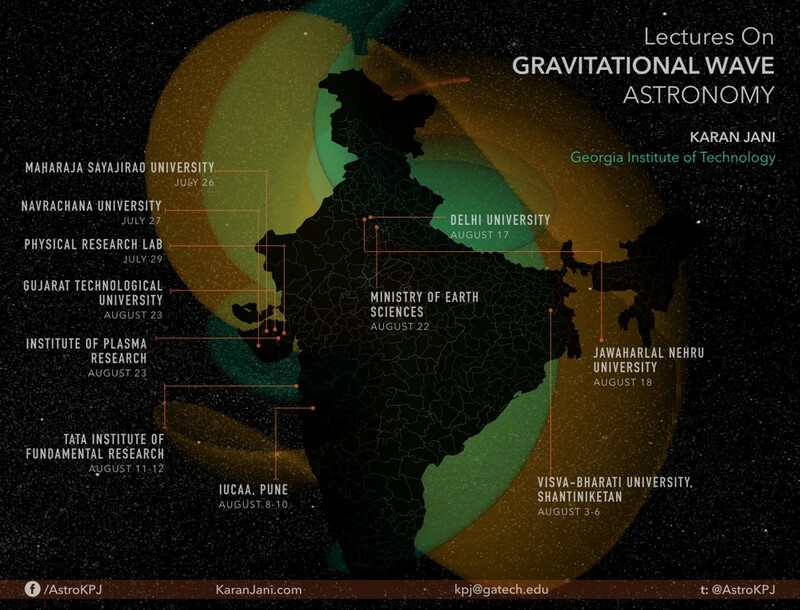 My original plan was to hold a two-week long summer school at a national university, so we can invite about few hundred interested bachelors-masters students from across the country and the experts can give them mini-projects with them on astrophysics and experiment related to gravitational wave. But sitting here in the US, I simply could not find funds or convince any Indian university to take a lead on this. So I decided to visit as many national universities, colleges, research institutes and high schools I possibly can in ~four weeks in India. In this way, not only I reached out to almost 5000 students, and hopefully got them curious about gravitational waves, but also got to closely observe the scientific research environment and curriculum at all levels of universities (private, state, national), and every major research institute of the country. And being at this very grassroots level, discussing with students from canteens to pubs, with professors to deans to vice-chancellors to industry honchos, I am so convinced that the innovative solutions that India demands from her 65% youth populations, so that we can resolve our incredibly complex issues and make the world say Jai Hind, can happen only and only by strengthening research in colleges and universities (and not just national labs and institutes). When I mean colleges and universities, I mean the one next door in your hometown. IITs, IIMs, IISERs are doing great. But that is not representative of entire India. This year, like every other year, ~88% of total JEE qualifiers were male, and with coaching fees for entrance exams soaring lakhs of rupees, it should not surprise your ‘elite’ institutes are really catering to only urban-centric folks. So we can’t be expecting them to solve water crisis in the villages. While in the universities – be it local, state or national – enrolls your 65% population of India under age of 35. One of the senior professors at Delhi University mentioned to me, “In early 90s, the M.Sc students would be the English speaking youth from Stephen’s, Xavier’s or kids of bureaucrats. Today 75% of the entering class is from small towns and humble roots.” This to me seemed the proudest outcome of our democratic economic development. Now provide them with research opportunities, give them the chance to innovate during their Bachelors/Masters, and they will come up with solutions to problems that affected their day to day life, and of countless Indians (one day, this may help limit the ever increasing flux of funds spent on social welfare schemes). On the other hand, the research institutes and national labs in India are profoundly disconnected with higher education. At one of country’s most elite research institute, I inquired why they don’t collaborate with the local state university. The answer was quite typical, “Haan toh humney kab naa bola?”. Yea sure, but you have an army at your main gate! Barely anyone in that city knew what research goes inside this facility. It infact took me 15 minutes to convince the guards that I was invited here to speak and not ‘just a curious citizen’. And such security beefing was purely bureaucratic than for national security! This to my surprise was rather common for every research institute. The public cannot easily enter the facility. We spent thousand of crores making Express Highways and metro trains, but not a single R&D outcome is gained from it if our national labs don’t open its doors to the interested youth. While national research labs and institutes are supposed to work on priorities set by the government departments, the universities have the flexibility to foster more creative approach. And it’s not that our universities don’t do research. But, (a) it is not a norm beyond central universities, (b) university research resources are focused only for PhD students (c) heavy lack of facilities compared to research institutes (d) don’t have many collaborators (e) professors have insane teaching load (f) unnecessarily heavy coursework for graduate students! This is a preliminary list of issues, each of which has a history and justifications behind it. Though if you keep going on with status quo or incremental policy changes, our universities are going to become irrelevant in few decades. The massive online course moment has the world’s leading experts teaching semester long courses on every possible topic out there. With internet streaming now at its peak, and admission cut-offs reaching quantum limits, we will end up catering our youth resources to private online courses. The only way to keep universities relevant is by strengthening its research and innovation facilities. One of the questions I asked to every emeritus professor and higher ups in science bureaucracy that I had opportunity to interact, “Why couldn’t we predict importance of such megascience years ago, and in fact decades back when the a prototype of this detector was proposed?” This question is particularly important for young researchers like us who have to plan the career and also build human resources from this very instance to prepare for the next big scientific breakthrough. And if we don’t have a system in place, like the US has National Science Foundation, which funded LIGO research since 1980s, we will end up producing one more generation of frustrated Indian scientists whose very hard work is not seeing light for absolutely petty reasons. For the long term visionmap of making India the next science leader, we need to think beyond relying on wisdom of few eminent academic personalities and elite institutes. Only then research groups in universities will be able to take lead in initiating exciting new science in India. During the interactions with the science bureaucracies, I learnt about so many other megascience projects of the scale comparable or beyond LIGO-India that our taxpayers funds are being invested in. But only if the students in the 10th grade social science class were aware of the experiments our scientists are conducting from the Indian Ocean to Ladakh that will help understand origin of earth, so many of these students will go on to enroll in undergraduate geology programs in colleges across the country! After the Independence Day parade in my school in Vadodara, I asked the NCC cadets how many of them will like to one day join DRDO. To my jaw dropping surprise *they didn’t know what DRDO was! * And on a diametrically opposite instance, a farmer from a village with a population of just 450, travelled with his son for 3 hours one way to attend my public lecture. 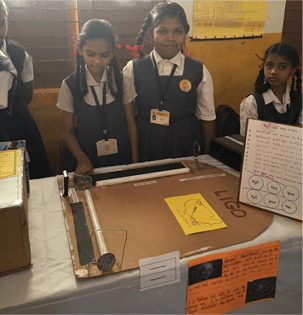 His son, Rahul, currently in 12th grade, mentioned that he first heard about LIGO-India project on All India Radio from the Prime Minister’s Mann Ki Baat, and plans to join B.Sc Physics program. Our discovery was on the front page of New York Times to most national dailies, every major news channel reported it, every big university and city had public lectures on it, but none of that could have reached this Rahul. What reached to him was the very sincere attempt to convey a highly complex science, in a language that was familiar to the citizens, and by a leader whose stature vouched for the authenticity of this information. This should be a motivation in every single government department that invests in R&D to form a framework where students and their parents become aware of national opportunities beyond enrollment in typical engineering/medical colleges. Out of the 20 academic institutions that I visited, not even dozen students from the ones I interacted were on Twitter! So probably a lot of us should reanalyze the amount of time being spent on trends and twitter wars, and may be just go out and concretely solve a real life issue. Also, for love of god, there is no intolerance anywhere in the Indian academia! If asked, I was always vocal about my positions on pseudoscience to ancient science, and everywhere the students and public at-large enjoyed the ‘orders of magnitude calculations’ to disapprove astrology. Everyone in my country can appreciate scientific temperament, you just have to present examples they can connect with. While I was driving from Shantiniketan to Kolkata, there was suddenly a burst of rainfall. In the middle of the fields next to the highway, there was a woman worker who was holding a small plastic to protect herself from the rain. The rain must have went on for an hour. What must be going on in her mind at that instance, holding a plastic and seeing a puddle being formed around her? We cannot stand even few minutes of idleness without checking phone. She must be looking at the cars passing by too, dreaming that one day her children be traveling in that. There are billion dreams, of billion Indians, some want to detect black holes from India, while some simply desire basic human necessities. And there is one man whose every breath goes in making those billion dreams a reality. We live in truly blessed times. Karan Jani is a co-recipient of the Special Breakthrough Prize in Fundamental Physics, a Senator Nunn Fellow on National Security and the Student Vice-President at the Georgia Institute of Technology. You can contact him on twitter @AstroKPJ.